In my post on August 26th I summarised the running careers and training of the seven elite marathoners who had set world masters marathon records at age 60 or greater and had remained high in the masters marathon rankings for over a decade. These seven enduring elite marathoners, John Gilmour, Eric Ӧstbye, John Keston, Derek Turnbull, Luciano Acquarone, Ed Whitlock and Yoshhisa Hosaka, shared several features. Apart from John Keston who had only began running at age 55, all had shown signs of athletic talent in their youth, but none were of international class at that stage. The primary feature that made them world champions was a reduced rate of decline in early middle age. Furthermore, apart from Erik Ӧstbye who rarely ran on the track, all maintained their speed, recording international level times for 1500m during middle age. However, while all seven trained consistently and raced with determination, they employed a range of quite different types of training, suggesting that their enduring success owed more to their natural predisposition to longevity than to the type of training they did. At first sight, it might seem that there is little that a less gifted runner might learn about how to train from these exceptional individuals. I do not think that is the case. On closer inspection, examination of the differences in the training of these elite athletes in the light of what fifty years of research has taught us about the physiology of training provides potentially useful pointers towards the most effective training strategies for minimising decline in performance during middle and old age. The crucial limit imposed by aerobic capacity. If we are to run our fastest possible marathon we need to train many different physiological capacities. These include the ability to conserve glucose so that our supply of easily accessible fuel does not run our before the end of the race; the ability to metabolise lactate so that we can maintain a metabolic rate at a little above 80% of our aerobic capacity (VO2max) for several hours without continual accumulation of acid in our blood; the ability of leg muscles to stand the pounding produced by more than 30,000 foot-strikes; we need to maximise our VO2max; and several other attributes such as an efficient running style. Maximising VO2max in itself requires maximization of several trainable physiological attributes, including aerobic enzymes in mitochondria; capillary blood supply to muscles; and cardiac stroke volume. Among all these trainable capacities, VO2max is especially noteworthy because it plays a crucial limiting role. One of the important contributions of the great coach, Jack Daniels, to running science, is the realization to there is a quality, VDOT, which is a measure of aerobic capacity and corresponds approximately to VO2max, that provides a fairly accurate prediction of a runner’s best performance at any distance in the range 1500m to marathon. The rationale underlying the prediction is based on the assumption that aerobic capacity, quantified by the value of VDOT, is the limiting factor that determines performance across the range of distances. This assumption is controversial. An alternative view is that performance is limited by a ‘central governor’ in the brain that acts to protect us from harm. In fact the apparently competing claims for the role of aerobic capacity and the central governor as the factor limiting performance can be reconciled, but that is a story for another blog post. In practice, predictions based on VDOT are usually fairly accurate for well-trained runners. If a runner is adequately trained at 1500m, performance at 1500m provides good estimate of aerobic capacity as quantified by VDOT, and in turn this value of VDOT can be used to predict marathon performance, provided the runner is adequately trained for the marathon. The implication of this is that any consistent training program can maximise all the other factors such as ability to conserve glucose; ability to metabolise lactate; and the ability of leg muscles to stand the repeated pounding, so that the limit is set by aerobic capacity. This does not mean that these other factor do not play an essential role in performance. It simply indicates that these factors can be trained to the level where they are no longer the limiting factor. Aerobic capacity itself can also be trained but it remains the limiting factor. Was aerobic capacity the limiting factor for the elite masters marathoners? What relevance does the limiting role of aerobic capacity have to understanding the phenomenal success of the seven elite masters marathoners? The first question to ask is does Daniel’s VDOT formula work for them? Because it is reasonable to assume that they were adequately trained for the marathon distance, it is appropriate to ask how well their marathon performance predicted their performance at 1500m. Marathon times and 1500m times recorded on occasions no more than approximately a year apart are available for all of the seven of elite elderly marathoners apart from Erik Ӧstbye, who rarely raced on the track. Table 1 lists age, marathon time, estimated VDOT based on marathon time, 15000m time predicted from VDOT; actual 1500m time recorded on a race; and percentage error of the estimate. It can be seen that the percentage error is typically around 1-2% and never exceeds 2.5%. Granted that race performance on any one occasion might differ from maximal by a few percent, it appears that for these six athletes, their performance across distances from 1500m to marathon was determined largely by their aerobic capacity. The conclusion receives further support for the observation that in the case of Ed Whitlock for whom we have a measured value of VO2max less than a year before the marathon I have used to estimate his VDOT, the estimated VDOT of 52.9 ml/min/Kg is within a tenth of a percentage point the measured VO2max of 52.8 ml/min/Kg. The data suggests that other factors might have contributed a percentage point or two to the performances of the six elite athletes. While a percentage point or two might matter in a race, it is merely the icing on the cake when it comes to understanding why these elite athletes stood head and shoulders above average athletes of similar age. Thus the crucial question in understanding what made these athletes elite is the question of what endowed them with values of VO2max about twice the values expected for the average man of similar age. Aerobic capacity is trainable, but it is also shaped by genetic factors. As I previously discussed (2nd August) in the case of Ed Whitlock, I think it is likely that his very high maximum heart rate contributed appreciably to his extraordinary VO2max. Maximum heart rate appears to be largely determined by genetic factors. Those of us with lesser genetic endowment have little hope of matching Ed’s performances. However, if we accept that consistent training can optimise the factors other than VO2max such that these other factors are no longer limiting, if we wish to maximise our distance running performance in middle age and sustain that level of performance (relative to WAVA norms) into old age, the major question is how can we maximise our aerobic capacity and how can we sustain a maximal value over a prolonged period? To address these questions we can draw on several different strands of evidence. Two of the most important strands of evidence are the body of evidence regarding the nature of overtraining and the evidence regarding polarised training. I have reviewed the evidence regarding over-training including the role of cortisol on several occasions previously (e.g. here and here). In summary, effective training achieves it benefit by stressing the body in a way that elicits an anabolic state that strengthens the body so that it can withstand similar stress more effectively in future. However if there is inadequate recovery, there is sustained elevation of the stress hormone, cortisol, that obstructs the anabolic phase, while also creating a risk of chronic inflammation which promotes the replacement of healthy tissue by fibrous tissue. The evidence regarding the relative merits of high volume training compared with high intensity training (reviewed in my post of 31st March) indicates that high volume and high intensity training are each effective in increasing aerobic capacity. However, accumulating evidence indicates that polarised training, consisting of a large volume of easy running and a small amount of high intensity running, produces the greatest increases in aerobic capacity in athletes who have already achieved a plateau of fitness, and offers the best prospect of long term improvement, year upon year. Bearing in mind the necessity for avoiding over-training via adequate recovery, and the evidence indicating that polarised training offers the best prospect of year on year improvement, it is worth a closer look at the training of the seven elite ancient marathoners. It is noteworthy that two, Ed Whitlock and Erik Ӧstbye, adopted a markedly polarised program consisting of a very large amount of easy running together with a quite small amount of intense running, mainly in the form of shorter distance races, over a sustained period of years. It is also important to note that Whitlock emphasizes the importance of building up the volume of his training very gradually, and on minimising impact stress on his legs during his long runs. Ӧstbye set world marathon records in the age bands 40-50; 50-55; 55-60 and 60-65, and remained high in the rankings until age 70. Whitlock has dominated the world masters marathon rankings for the past 15 years, and holds the current single-age world records for 11 of those 15 years. In contrast, Yoshihisa Hosaka has adopted a program that includes a higher proportion of running at marathon pace or faster. During his twice daily interval sessions he runs approximately 10 Km per day at marathon pace or faster. As might be expected, his quite demanding program has led to very impressive performances up to age 60. As discussed in more detail in my post of 18th August, over the period from age 45 to 60 his performances declined at about half the rate expected during that age period. However, since age 60 his performances have declined at a rate about 70% faster than expected on the basis of WAVA predictions (as illustrated in figure 1). It would be unwise to draw any definite conclusions this stage. It will be very interesting to see how he fares in his ambitious quest to capture Derek Turnbull’s M65-70 record in the Waterfront Marathon in Toronto this November. However, as reported in his interview with Brett Larner at the time of last year’s Waterfront Marathon, he is finding it increasingly hard to manage his demanding training and might even consider changing to switch to a program more like that of Ed Whitlock. Figure 1: The decline in marathon performance of Whitlock, Turnbull and Hosaka. 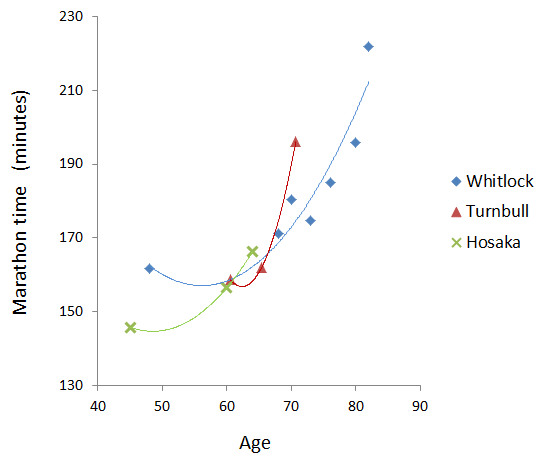 Apart from a minor ‘stutter’ at age 70, Whitlock did not exhibit marked decline until age near to 80; Turnbull exhibited a marked decline in his late 60’s ; Hosaka shows a trend towards an even earlier decline. The data point at age 64 represents his time in the 2013 Gold Coast marathon. John Keston trained with fierce determination and great success from his later 50’s until age 70. In 1994, it appeared likely he would become he first 70 year old to run a marathon in less than three hours. However, despite running 20 marathons in the year, he failed to achieve his target. He almost achieved the three hour mark a year later, but then sadly suffered a series of accidents and injuries. After his return he adopted a training program based on about 2 hours of running every third day with a similar period spent walking (often in woodland) on each of the intervening days. Though he never quite recovered his former dominance, he nonetheless continued to perform at very high level for another decade. At age 82 his marathon time was 6th in the all-time rankings for the M80-85 category at that time. It is more difficult to draw conclusions concerning Luciano Acquarone, Derek Turnbull and John Glimour due to lack of detailed information about their training. John Gilmour experienced more than a life-time’s worth of stress during his three years as a prisoner of war, and as far as I can gather, did quite a lot of demanding tempo running during his training. His training can scarcely be described as polarised. He remained near the top of the world rankings over a 12 year period from age 59 to 71, and continued to run for a further two decades, even in his 90’s still running 5Km per day. He certainly qualifies as an enduring elite marathoner but his time at the top of the rankings scarcely matches that of Ed Whitlock who shows no sign of relinquishing that position after 15 years. Derek Turnbull did not follow a planned training program, but his spontaneously selected paces were often quite fast. In his obituary, Roger Robinson described Turnbull’s training as a perfect balance of long runs, tempo, and fast work. Almost certainly this ‘balance’ included substantially more tempo training than a polarised program. Of the seven elite marathoners we have discussed, Turnbull had the shortest time at the top of the rankings, a period extending from his world record for the M60-65 category set at age 60 to his time 3:15 at 70, which at the time was 13th in the rankings. As shown in figure 1, the decline in his performance in his late 60’s was marked. Thus, despite the fact that all seven of these elite elderly marathoners were superb runners, when one looks in detail at the differences in their training programs, the available evidence indicates that those who adopted a more polarised training regimen, with a large amount of easy running and a small proportion of intense running, achieved greater longevity at the top. In a small sample of exceptional individuals it is of course possible that other differences, possibly directly associated with their natural predisposition to longevity, accounted for the observed longer duration at the top of the rankings. However, one fragment of evidence provides intriguing support for the claim that the training regimen made a crucial the difference. Ed Whitlock’s progress did stutter slightly at age 70. His times of 2:51:02 and 2:52: 50 recorded in the Columbus Ohio marathon at age 68 and 69 respectively made it appear highly probable that he would become the first to break 3 hours at age 70. He did not manage it that year. Nonetheless, despite some problems with arthritis, he continued to build up the frequency of daily 3 hour runs in the following two years. At age 73, after doing 67 three hour training runs in the preceding 20 weeks, he ran the Toronto Waterfront Marathon in 2:54:49, surely the most impressive marathon time ever recorded by a masters athlete, and one might argue, no less impressive than the 2:03:23 recorded by the current world open record holder, Wilson Kipsang. There is another point that should be re-emphasized. Although the striking feature of Ed’s training was the daily 3 hour runs, he did also do some fartlek style speed work, and raced frequently over shorter distances. I suspect that this small but significant amount of faster running helped maintain his world class performances over 1500m and in particular ensured that 1500m time in at age 73 showed only a 1 second decrement from performance at age 72, whereas WAVA would have predicted a 5 second decrement over the year. As shown in table 1, for all six of the athletes for whom 1500m times are available, the comparison of actual 1500m time with the prediction based on VDOT calculated from their marathon times demonstrates that all maintained their speed over the shorter distances. All six did at least a small amount of faster running during training. Thus, it is likely that at least a small amount of intense running was an important component of their training. It should also be emphasized that drawing general conclusions from the experiences of a small number of exceptional individuals is fraught with danger. If Hosaka can arrest his recent decline while continuing the twice daily interval training he did in his early 60’s, it will be necessary to re-appraise my current conclusions. But the evidence so far does confirm what would be expected on the basis of the studies of training physiology performed in samples more representative of typical runners, over the past half century. The key lesson is that a large amount of easy running together with a small amount of faster running is the best strategy for sustained optimal performance. Furthermore, avoidance of cumulative stress is essential. Ed Whitlock’s example suggests that this is best achieved by very gradual build-up of the training volume. In my post of August 26th I mentioned Tim Noakes’ hypothesis that an athlete can only expect to remain at his/her peak (relative to the WAVA age norms) for a few years on account of the damaging effect of the training and racing required to attain one’s peak . Although the seven individuals we have been considering are clearly exceptions to any such rule, they do offer interesting insights into the limits to the validity of the hypothesis. In my next post I will examine the evidence for and against that hypothesis. This entry was posted on August 30, 2014 at 9:49 am and is filed under Physiology, Training. You can follow any responses to this entry through the RSS 2.0 feed. You can leave a response, or trackback from your own site. Again, good reading Canute. Interesting about VDOT and aerobic capacity being the limiting factor (and very accurately predicting 1500m performance). Would the minimal speedwork these ancient marathoners do skew the percentage of aerobic to anaerobic requirement in a 1500 towards the aerobic? I think Sebastian Coe for instance, was of very modest cross country ability compared to his 1500m ability. I’m also extremely interested to see how Hosaka performs in Toronto. Thanks for your comment. You raise a good point about Coe. VDOT is only a good predictor across the range from 1500m to marathon if the athlete has developed all of the other required capacities to the point where they are no longer limiting. I suspect many top level middle distance runners do not adequately develop the endurance capacities required for long distance running. Cross-country also requires its own specific abilities. On the other hand, in top level open 1500m races, the final few percent provided by other attributes are probably of greater importance than is the case in masters marathon races (though in top level open marathon races the few percent that comes from mental strength often plays a crucial role). Nonetheless, I think the accuracy of VDOT prediction for the elite masters marathoners indicates that the thing that set these elite masters head and shoulders above the average runner was their aerobic capacity. And it is important to note that the small proportion of fast running done by six of them, on top of a high volume base, was enough to produce world masters ranking in the 1500m. The same could also be said of Snell’s 800m and 1500m victories in Rome and Tokyo. The aerobic base is the is the foundation for both middle and long distance. Coe almost certainly had the aerobic base in addition to the specific requirements for 1500m (eg type 2 fibre development) but maybe lacked ether the endurance and/or the specific requirements for cross-country. We will both be awaiting the 2014 Waterfront Marathon results with great interest. Thanks Canute for a fascinating read over the last few weeks– I’ll definitely be reblogging it in the coming days! Apart from the obvious genetic potential that these individuals possess, I can’t help but wonder whether other aspects of their lifestyles may be contributing to their longevity? Something tells me that few of them had desk jobs, for instance. It is likely that otehr life-style factors played at least some part. Several of these elite master marathoners did have desk jobs, or were retired. Yoshihisa Hosaka is a business man who no doubt faces pressure at work, but as far as I know does not do demanding physical labour. Ed Whitlock has blossomed as a marathon runner since his retirement. In contrast, Derek Turnbull was a sheep farmer and by all accounts, spent most of his days engaged in quite demanding physical labour. Maye this contributed to the abrupt decline in his late sixties. It would certainly have been impossible to combine the demands of farming with the long hours of low intensity running that formed the core of Whitlock’s training. My own job is essentially a desk job, though I am often on my feet. In my younger days, I did much of my training late at night. I usually felt fresh and energised by the night air. It was only during periods of especially long hours at work that work impacted appreciably on my training. However nowadays I arrive home utterly exhausted after even a moderately long day at work. I am aware that as I plan a Whitlock-style training schedule, I will have to make significant adjustments to allow for my work schedule. As always very interesting. I myself at age 51 am in the process of establishing an endurance base I hope to maintain for many years. I was not a runner in my youth although I engaged in a variety of sports ( resulting in more than a few injuries ) and maintained quite regular exercise. In order to combine lifestyle goals with the building of my endurance base I commute to work every day running various distances with a backpack. My buildup has been gradual and I currently ran 313 miles in August averaging over 70 miles per week. I know this isn’t considered high mileage to many distance runners, although among those in my local running group I believe I am now maintaining the highest volume. I think some aspects of this approach may lend themselves to longevity. You haven’t said much about the potential effect of doubles. I feel the morning/evening nature of my routine was one aspect that allowed me enough recovery that was conducive to building volume. My routes are uphill in the morning and downhill in the evening so the harder runs come after a full night rest. All my weekday runs are done at a comfortable aerobic pace, while with the back-pack and the hill the HR may come out of easy zone on morning run the muscular pounding is minimal. I do single long runs on Saturday with my group ( probably to hard at times due group pacing) and recovery runs on Sunday. I personally think that doubles can be a very effective way of building up a large training volume with relatively little stress. Forty years ago, when I ran 16Km twice daily for many months, I found it very beneficial, though I ran at a pace not far below marathon pace and in retrospect I think I would have been better do have adopted an easier pace. Hosaka was the only one among the elite masters whose training I reviewed, who regularly did doubles. In my analysis I noted that Hosaka might be showing early signs of decline. It is still too early to draw definite conclusions, but if indeed he does continue to decline excessively, I would blame the intensity rather than the fact he runs doubles. I am currently experimenting with a modified Whitlock-style schedule including a single long duration session most days. However, if I find I cannot cope with this, I will probably switch to doubles several days per week. The greatest practical problem for me would be finding enough time in the day for doubles. If you can do them into your commuting time that helps. But make sure you look after your knees if there are any steep descents on the down-hill run home – I focus on aiming for the sensation of ‘soft knees’ when running down-hill. It is often claimed that the benefit of the single long run is that it trains all the grades of muscle fibre by virtue of sequential exhaustion of the different types of fibres, starting with the slow twitch. This sounds plausible but I am not aware of any direct evidence that it is true. Great article specially for master runners…….